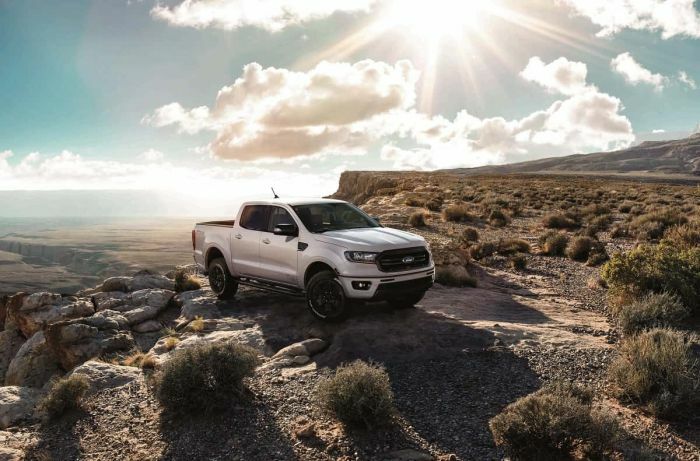 Ford showed off its all-new 2019 Ranger pickup's latest appearance package. This one is called "Black." As you can see from the image of the 2019 Ranger with the Black Appearance Package, that does not mean the main body color is necessarily black. In fact, you can get the 2019 Ranger with the Black Appearance Package on any color Ranger. Ford's other appearance packages for the Ranger include the Sport Appearance Package that adds unique wheels and Magnetic Gray-painted accents and Ford's Chrome Appearance Package with bright chrome wheels and chrome body accents. Ford says that the company expects fully two-thrids of its trucks to ship with an appearance package. The Ranger Black Appearance Package is available as an option for $1,995 and can be ordered at dealers now. Trucks ordered with this new package are expected to be delivered in early summer. Related Story: Ford Finds a Global Partner For New Ranger Pickup Platform - Will It Be Rebadged For North America?